When most of today puzzle games simply deal with multiples of 2048, Numbreaker features a brand new addictive game design where you must think more and fast. In Numbreaker, you must combine several numbers with operators in order to reach target numbers and get rid of blocks. Easy at first sight, but harder and a lot more challenging when time and space are limited! Break the blocks down before the limit line is reached and complete the level's goals to win! Numbreaker rewards audacious players forming complex operations: the more numbers you combine, the more points and bonuses you get. Operators you use matter too: while addition gives you a few points, division brings you a lot more! But be careful... Time is running. With 50 levels and more to come, Numbreaker offers great times of playing while each level can be done quickly during commuting. Difficulty is changing from one level to one other as targeted numbers as well as block numbers and time differ. Your progression is synchronized between your iOS devices with iCloud. Challenge your friends online with 3 game modes for 2 players: "10,000 points", "Clear board" and "Survival". Online playing requires Game Center to be enabled. 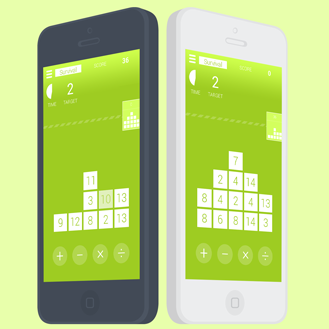 Numbreaker is currently only available for iPhone and iPad running iOS 7 and greater. © Copyright 2014 Benoît Gourdin. All rights reserved.